I’ve been an ice cream fan for some time now. Heavy cream, sugar, and chocolate…what’s not to like? Not all ice creams are created equal. Some have little flavor, and bad texture. Some use chemical fillers, and have gooey chunks of candy in them. In my opinion, here are a few things that make quality ice cream. First of all, the percentage of butterfat superiority- the higher the butterfat content, the better the flavor. Secondly, the density of the ice cream also determines quality. The less air in the product, the better ice cream you’re going to have. This being said, I’ve been in search for the perfect scoop of ice cream for a while now. I ordered a scoop of chocolate, my friend ordered cake batter ice cream, and her son had a single scoop of vanilla. “That will be $10.50 please.” Wow, that’s expensive for three scoops of ice cream. Anyway, I wasn’t about to complain, I was too excited to try my cone. The chocolate cone was average. I could tell that the butter fat content was high, but it lacked true chocolate flavor. I tried my friend’s cake batter ice cream- it tasted exactly like cake batter! I’m not sure what they put in it, but the flavor reminded me of a Duncan Hines Vanilla cake mix. The vanilla ice cream was good, but not exceptional. The ice cream was good at Cold Stone Creamery, but it’s very expensive. I’m not sure what all the fuss and extra cost is about; maybe it’s the large marble slabs and show the skilled workers put on. 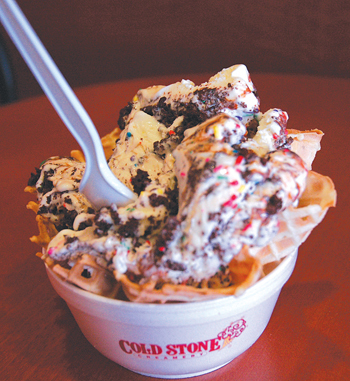 Try Cold Stone Creamery, and let me know what you think. I have been to coldstone several times and also think that there is nothing exceptional about it. Way overpriced for average icecream. Sure its fun to create your own scoop but i can mix all of those ingredients at home with higher quality products! My vote is for Bruster’s icecream!! The Rasberry Chocolate Truffle is outstanding!! YUMMM!! Not sure- I would imagine at least 30 degrees. I love ice cream! yummy yummy yummy is there a way i can make this my self ? I too am an aspiring blog writer but I’m still new to the whole thing. Do you have any tips for rookie blog writers? I’d genuinely appreciate it.